Corner” in a Mom & Me space? What, is he crazy? Well, as it turns out, he may not be. He put in some of his vintage pens that he took from his other case in the store (case 409), some beautiful paperweights that I had admired when he first purchased them, and some funky art pieces that frankly make me laugh every time I look at them. (The “Primitive Printers” on top of the case is so ugly – it can only be a piece for a man cave or a writer with a sense of humor. Anyway, he set the case up and immediately it started to gain attention. Mostly from the men who’s wives were forcing them to wait while they visited my lovely linen selection. I began to see my husbands thinking here. Mom & Me should be a shop that everyone could enjoy. Of course his reasoning was that it helped poor husbands who are doing their best to pass the time while waiting. 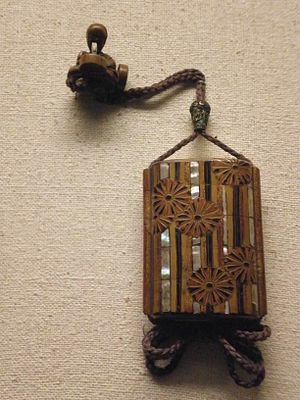 Then he began to put in some Japanese and Chinese Netsuke carvings. Now he had my attention and, as it turns out, some of the attention of my visiting wives. Now he has three cases – two in Space B30 and one in Space B26 where he has many of his older Victorian items. Good for him – it keeps him out of trouble and out of my . . . well you know what I mean. LOved your blog and Your husband has, I think made your shop a bit more eclectic. I shared on Fb and google. Good luck and I’ll remember you when I am in need of your products . http://www.mallie1025.blogspot.com/ author of . . . And the Whippoorwill Sang, a funnny, poignant true family story of love, loss and survival, available at amazon and bookstores everywhere. Winner of the Nesta CBC silver book award for writing that makes a change in people’s lives throughout the world.. Interesting. I would like to see more of those art pieces and nick-knacks. I will be posting articles on selected items in the upcoming weeks. Thank you for your comment. Thank you. Happy that you liked it. More will be coming soon.